Because of His fathomless love for me, He had been in 'passionate pursuit' of me even before birth until I eventually, eagerly allowed myself to be 'caught' by the Lover of my soul and overwhelmed with His love. I was very humbled when I realised that He thought me worthy enough of His love to continue His passionate pursuit for so many years. Many are running from Him as I was, not realising that He is wooing and pursing us until we come to the point of yielding and casting all our cares and fears upon Jesus, and become lost in His loving embrace. He has gone before us to prepare the way - now He wants to lead us by the still waters and make us to lie down in green pastures with Him, where He can restore our soul - and lead us out from the darkness of each valley we walk through as we progressively die to our old nature. The brightness of the glory in the light of His presence dispels all darkness when we turn our eyes and hearts towards Him. 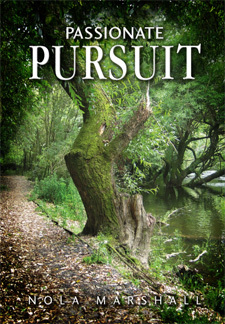 "For those who find themselves in the process of maturing in the Lord but have many unanswered questions about what is going on in their lives, Nola Marshall's book, Passionate Pursuit, can be of great help. She discusses with candor and wisdom the experiences and consequent feelings those who seek Him can both endure and rejoice in - and understand. God bless you with increasing ardor as you read."